Ghost Surgery – a despicable crime ! Ghost Surgery – A Crime performed on the unconscious ! Medical Definition of ghost surgery: the practice of performing surgery on another physician’s patient by arrangement with the physician but unknown to the patient. This is a DIRECT, PERSONAL experience, not hearsay, which is ongoing. In case you are / or know Public Minded Lawyers willing and capable to take this and other similar causes to Supreme Court , let us talk – or share this post with them so that they may contact me direct using form hereunder. In any case I request you to share this post in your groups, Whatsapp , LinkedIn, FaceBook , Twitter, Google Plus etc. etc. – simply paste the weblink http://lawforall.in/ghost-surgery/ therein – or use any of the sharing buttons provided below. Thanks a LOT. You may save some people’s lives ! Medical Negligence is a crime VERY difficult to prove since generally done behind closed doors of an Operation Theater. The guilty NEVER admit to their guilt, and even if caught go scot free mostly – – numbers speak for themselves ! If the trend continues, next time it could be you/yours/me/mine ! It has already been for my family and we are still suffering ! To have another physician operate on one’s patient without the patient’s knowledge and consent is a deceit. The patient is entitled to choose his own physician and he should be permitted to acquiesce in or refuse to accept the substitution. The surgeon’s obligation to the patient requires him to perform the surgical operation: (1) within the scope of authority granted by the consent to the operation; (2) in accordance with the terms of the contractual relationship; (3) with complete disclosure of all facts relevant to the need and the performance of the operation; and (4) to utilize his best skill in performing the operation. It should be noted that it is the operating surgeon to whom the patient grants consent to perform the operation. The patient is entitled to the services of the particular surgeon with whom he or she contracts. The surgeon, in accepting the patient is obligated to utilize his personal talents in the performance of the operation to the extent required by the agreement creating the physician-patient relationship. He cannot properly delegate to another the duties which he is required to perform personally. What does Indian Law say on this ? Are you / anyone you know a Sufferer on this/any other aspect of Medical Negligence ? Contact me using form hereunder to share your experiences, get and give help and advice to eradicate the malaise of Medical Negligence ! Thanks a LOT and Be Well ! ” The number of stent procedures in India trebled over the last five years, according to the National Interventional Council (NIC) registry 2015. Close to five lakh stents were implanted in 2015. No wonder many Doctors are keen to stent you up rather than look at alternative treatments – particularly if you are moneyed , or have a good insurance policy !! Of all the players, hospital margins appear to be the highest, touching about 650%. Incidentally, along with stent companies, it is hospitals and cardiologists who have been most vocal against price control for stents+ . Based on data submitted by stent companies, NPPA has worked out the margins at every level and the data shows that the margin on stents range from 270% to about 1,000%. 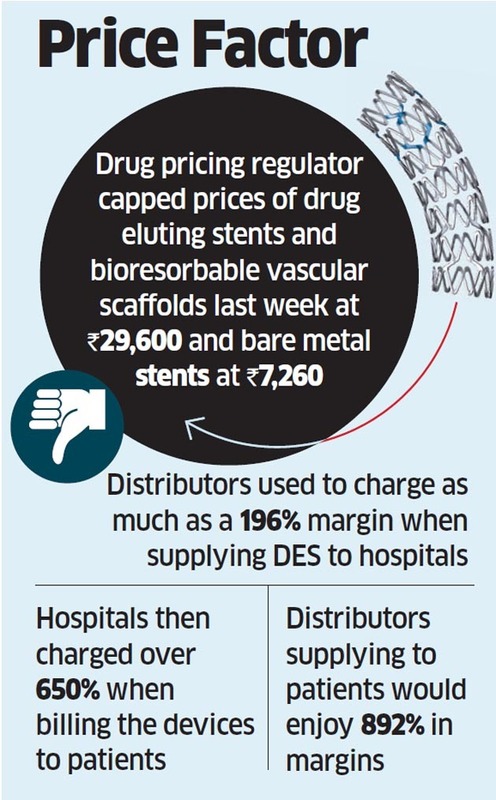 ” Distributors used to charge as much as a 196% margin when supplying DES, used in a majority of stenting procedures, to hospitals, according to NPPA. Hospitals then charged over 650% when billing the devices to patients, while distributors supplying directly to patients would enjoy as much as 892% in margins. * Senior health experts and doctors admit that ‘ghost surgery’ is widely prevalent in big hospitals where senior surgeons are slated to attend to 7-8 cases on a given day and in cases where they are to conduct surgeries under nominal rate packages such as the Central Government Health Scheme. * “Many surgeons who face scheduling conflicts with other procedures are often seen ‘showing up’ in the operation theatre just for a few minutes. Some even walk out after 10% of the surgery, but charge 100% fees,” says Dr RS Saluja, president, AP Private Nursing Homes Association. “Some walk in only to show their face to patients or offer hasty instructions to their assistants,” he said. * Some doctors from Delhi and Kolkata also agreed that it was a widely seen scenario in bigger metros also with patients complaining about such cases to the respective medical bodies. * Some experts say when patients pay for a service in a private set up, they are very well justified to expect that operation would be performed by the surgeon they have consulted in the beginning.